Single encore azalea ? dying while the rest appear healthy. Is this plant in the same area as the rest? if it is not, then I would say that the pH of your soil is thrown off, and can be corrected with a little dolomitic lime. 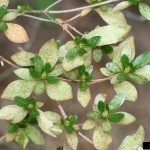 If it is in the same area then I might suggest that it could be a cultivar specific infection, which will require wettable sulfur, and dolomitic lime to correct. 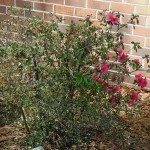 These azaleas are quite different than other cultivars, and may require different care. Alternatively, it may, simply, require some fertilization.